This is a highly recommended, well staffed Indian restaurant in Clapham which is an offshoot of Mum’s Kitchen. It is a small restaurant that is popular with bar and table service – book at busy times. Tables are small and for two or four, with a couple that can accommodate a larger group. They claim to offer “light, fresh and healthy meals”, with no butter or cream, so there are several dishes described as vegan. The menu is split into small plates (pakora, chaat, samosa and masala calamari), braised and stewed dishes (curry, dopiaza, masala, muttar – all with meat or fish), grills, vegetables (bindi, daal, aubergine etc cooked in interesting ways) and bread and rice. Brightly coloured and delightful pickles and mild tomato dip arrive on the table with some assorted poppadoms to start us off while considering the menu. We chose Railway Lamb curry, which had lamb that was really well cooked and layers of flavour in the sauce. Ghuggni chickpeas (black chickpeas braised in onion and mango powder), which was not as spiced or flavoursome as we hoped, compared to the khatte baigan-aubergine (baby aubergines spiced with tamarind and cumin), which was a definite hit. Both these small plates were vegan dishes. Then we ordered the chicken biryani (braised basmati rice cooked with chicken morsels in aromatic spices and rose water). This was a disappointment – the chicken was dry and the rose flavour a bit overpowering. To finish off the main dishes we had a chapatti which lived up to its description of wholemeal unleavened bread by being pretty heavy. To finish we ordered a p[istachio kulfi which comes on a stick and a gajjar ka halwa. The kulfi was great, the warm halwa an interesting very sweet dish that tasted of very little. So the whole meal was a good experience. A short menu, interesting sounding sets of ingredients, but it fell a little below our expectations. We will certainly return, but we will try a few other places before returning. 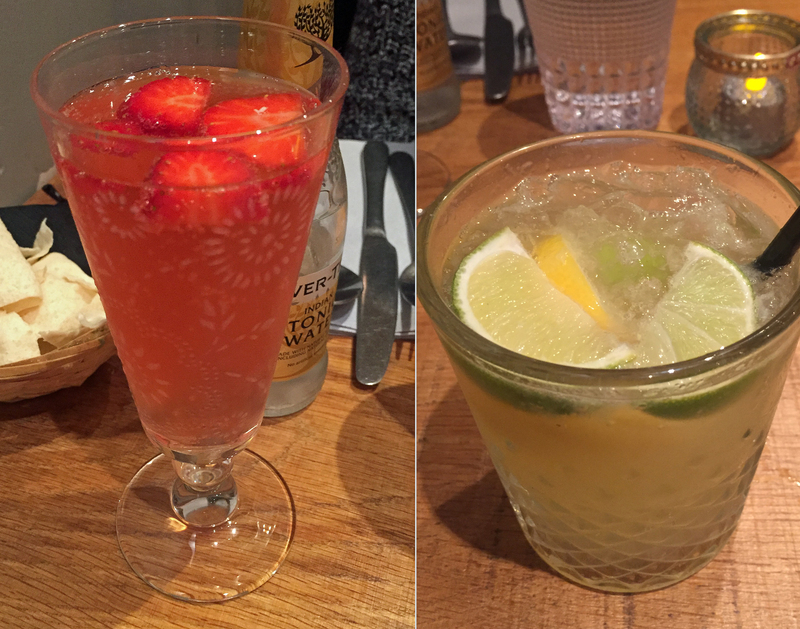 The bill was £59.06 including service with one strawberry cocktail and an alcoholic lime soda (at £7.00). We have been here often, over the years, (see here, here and here). Previous reviews have commented on how few people there were, so we were suprised at how busy it was, even if it was a Friday night. Boy was it busy, so remember to book in advance. It was fully booked upstairs, so we had to have a table downstairs (who knew), with a very noisy party of 20 men. It was hard to make conversation, even with the person sitting at your side. The staff are really helpful, warned us about the noise, fed us plenty of poppadoms on the house and got our food as quickly as possible. It does not have a license, so bring your own or buy around the corner. There’s several places to get your booze but we had met up at the relatively new craft beer place, The Sympathetic Ear, on Tulse Hill. (That’s opposite Sainsbury’s, for those worried that it might be at the West Norwood end.) So we all had cans of the excellent Peckham Pils. 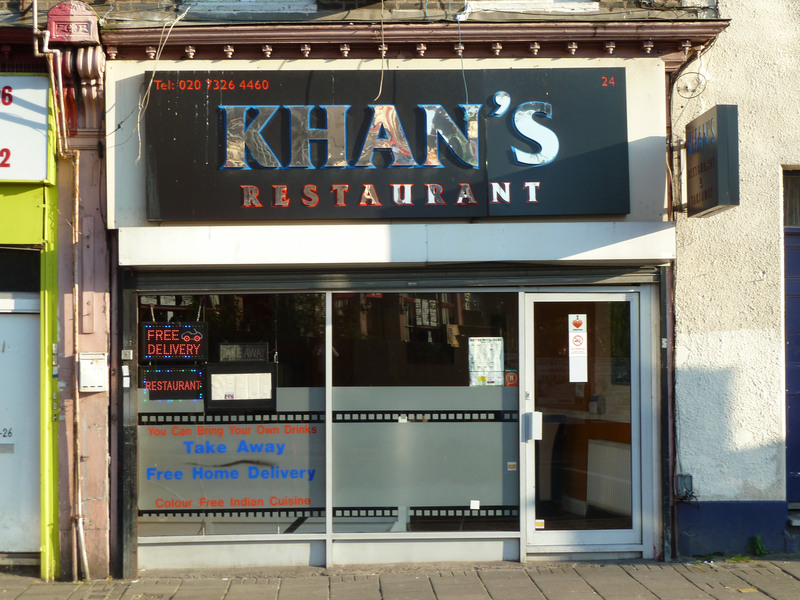 We chose mainly from the Khan’s specials, highly recommended part of the menu. But there was a lot to choose from, with starters covering all the usual fare – meat and vegetable pakoras, puris and samosas, kebabs and obviously onion bhaji. 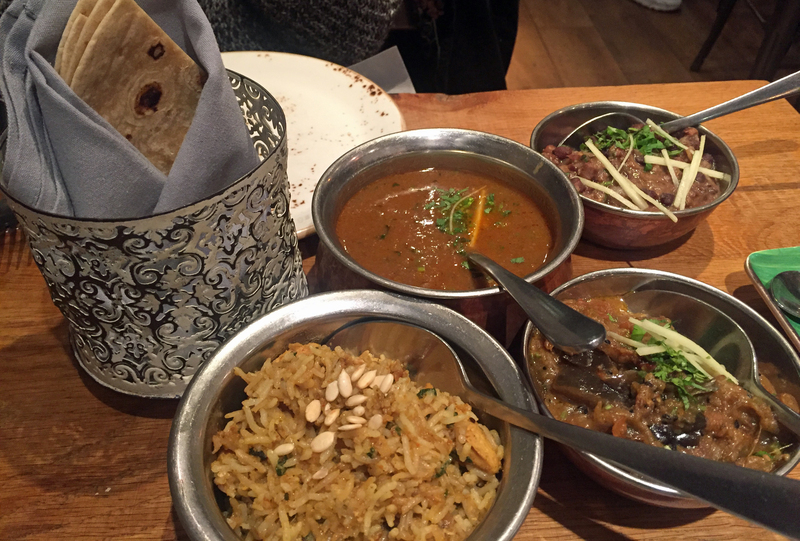 We ordered some onion bhajiis to stave off the hunger pangs and for mains we went rogue with butter chicken, chicken korna, chicken tikka bhuna and murchi lamb accompanied by plain naan and pilau rice. Our dishes may not be quite hot enough for the Friday night hardened chilli eater, but they were just right for us. The butter chicken was really a bit of a wash out. Although the chicken was soft to eat there really was too little spice. The korma was a step up but in my view the bhuna was the best. The spice with the tomato and onion was a big step up and, although without too much heat, the dish was at least a few different textures. The lamb got a favourable reception as well – well cooked and not tough and gristly. The naan was hot and light and the rice was very well balanced – not too much salt or coriander but enough to detect. The bill for four of us came to around £70, so it’s still good value. We will be back, but just not on a Friday night. For our Friday night curry fix we will probably just order the takeaway from their website. This is the Coldharbour Lane branch of this small chain – there’s just another one in Fitzrovia. The food, says the owner, Shrimoyee Chakraborty, is inspired by her mum’s cooking and the “amazing local cuisine” of Calcutta. We’ve been a couple of times in the evening and been seriously impressed by the exciting cooking on offer. It’s a particularly good replacement for what was previously yet another burger bar. This is on the second floor of Pop Brixton – the arrangement of storage containers near the Recreation Centre. It is a narrow corridor of a restaurant with just one line of tables with bench seating inside for about 20 covers but there is a bit more space outside in clement weather. When we arrived there was a 40-50 minute wait unless you were prepared to sit outside – we were hungry enough to put up with the bracing evening air. We have been here before and not much has changed so look here for a full account. You’ll also have to look there for some photographs – on this visit it was too dark to get any thing worth including. We chose four options from the short menu. We chose our favourite Bhel Puri which has raw mango; Samphire Pakoras; Torched mackerel. The Bhel Puri was fantastic and we polished this off really quickly. The idea of Samphire Pakoras is great but we had forgotten that in practice they tend to be a bit woody and, hence, they were not our favourite. Unfortunately, we had ordered two portions and we failed to work work our way through them both. On the other hand the torched mackerel was really tasty and we would definitely try it again. We washed it all down with a fresh lime soda and a bottle of Curious Brew Lager. The total bill came to £31.35. We didn’t linger and will certainly look up our review next time we come, so we can avoid things that weren’t great. It’s a shame you can’t book but, nevertheless, we will return so that we make our way through the rest of the interesting menu of what is still some of the best food in Brixton.